Preventing crime and violence is a task, which not only the City of Frankfurt is confrontated with. We know that there are also international visitors of our website, so that we are now able to provide a survey on the activities of the local Council for Prevention of Crime and Violence in the English language on the world-wide-web. Unfortunately it is not possible to translate each site of the original German performance one to one and to keep it updated. But we had done our best to give you an impression of our most important works, and of course in order to give you, hopefully, some useful informations. - Bakery bags "Violence - Notice - Help"
- Concept "Be cool - stay cool"
- Concept "Security in stores"
- Poster campaign "Frankfurt forum" and "Violence against women"
The guaranty of public safety is an all-state duty, a duty of the states within the Federal Republic of Germany and of their connected police. On the other hand, it is common knowledge that 80% of all criminal offences recorded by the police have local offenders or local reasons. Especially in times when citizens are worried about security, the criminal prevention and local security policy must also be seen as a priority duty of the cities. Even though German cities haven’t got their own police, it is necessary to create structures, networks and partnerships to cut the ground from the repeatedly new causes of criminality. The City of Frankfurt has acted correspondingly. In November 1995, it set up its own security department. This department includes the most important offices in the security sector, namely the town clerk’s office, the public authority responsible for aliens, road traffic authorities, traffic control as well as the department of the prevention council. This department is the central contact for the police as well. It coordinates the cooperation and every information as well as all complaints of the citizens run together in this department. The coordination of the authorities take place in regular discussions between the chief of police, the Lord Mayor and the head of the security department. Establishing this kind of competence and a clear assignment of duties within the city administration, guarantees prompt reactions in case of conflicts, short ways of information between police and city administration and last but not least it first of all enables the institutionalizing of an effective cooperation. 4. Task Force of security services. Separately trained staff which can be reached 24 hours a day. Problems are recorded and worked on independent from competence. As another important forum to coordinate the municipal security interests, a prevention council was set up in July 1996. The Lord Mayor, the mayor, the head of the security, the social, the school and the integration department, the chief of police and the head of the office of the district attorney are members of this council. This prevention council has the duty to implement development strategies to prevent criminal offences with all social power in the City of Frankfurt. The prevention council collects information and gives impulses. The council records criminal preventive scenarios and works out problem analysis. Three working groups are associated to the prevention council. The first one is the so called drug working group. It successfully takes care of drug prevention in Frankfurt. The liquidation of the drug scene, the decrease of dead due to drugs and building up a varied relief network is the success of this working group. Another working group called security, examines the complete field of the subject criminality and security in its different facets. The biggest success of this working group was the creation of the “joint working group foreign serial offenders” (GAI). Two police officers and two civil servants of the public authority responsible for aliens work together target-oriented in this working group. While the municipal side takes care of the deportation orders, the police ensures that foreign serial offenders are taken into custody. Because of this cooperation it is possible to deport annually about 100 serial offenders with approximately 4,800 cases and this has considerably reduced criminality in the City of Frankfurt. The third working group called youth and prevention takes care about problems such as truancy and juvenile delinquency. This working group addresses reasons of new social trends and the youth welfare planning is harmonized with it. · Security campaigns, security advice and strengthening of the social and neighborly engagement. The matter of fact that the competence of the people on the spot is included, guarantees that the real problems are being picked up and worked on. Since the regional prevention councils’ businesses are managed by the branch office, it is ensured that the working method is target- and result-oriented. A special feature of the Frankfurt model is the structure of a prevention hierarchy which extends to the urban districts. The distribution of functions and the most important decisions are made on the prevention council level. Questions which came up, are professionally handled on the working group level. The local solution of problems occurs on the lowest level, the regional councils. Once a year, all organizations which are engaged in prevention are invited to a prevention conference. The target of this conference, which is prepared with a questionnaire, is to make out negative social trends in due time, so that counter-strategies can be seized. Among others, the workshop protection for youth, the workshop consequences from the terrorist attacks in New York, and the workshop new media came into existence after the last prevention conference. Now I would like to present some working examples of the prevention network in Frankfurt. Campaign "Violence - Notice It - Help"
The most important order of the prevention council for police, city administration, public prosecutor’s office was to promote tolerance and moral courage among the citizens of Frankfurt. The increase in violent crimes where through-travelers just watch without doing something, caused the prevention council to take steps against this “non-culture of looking away”. A working group, which overlaps the authorities. has taken over the management as a steering committee and started the campaign “Violence - Notice it - Help” in 1997. This campaign accompanies social life in Frankfurt and motivates the citizens in moral courage and solidarity with always new ideas and actions. The target of this campaign is to motivate the citizens to help and to strengthen the sense of responsibility and duty. The willingness for moral courage shall also be promoted. A culture of watching, reduces the phenomenon of looking away and makes criminals insecure. Procurement of decision-making and responsibility is the core of this campaign. Information on behavior in violent situations are given in public performances, workshops, school events, in theatres and in all areas of social life. The information is transported by 175.000 flyers, cinema and TV spots and posters. It was possible to acquire all social forces such as taxi drivers, bankers, bus and subway drivers, churches, labor unions, women associations, sports clubs, schools and welfare institutions and so on. The message of helping and watching was transported into schools with the motto “Be cool – Stay cool”. Oriented at the target group, many small actions supported this campaign. Swiss newspaper article on the campaign in English and French language see sidebar on the right. Bakery bags: Violence - Notice It - Help"
There was advertisement for moral courage printed on 170,000 bags which were used in more than 30 bakeries in Frankfurt. The spontaneous readiness of a baker, who supported the idea of the prevention council with a jointly sponsor action, made this possible. This activity caused a large echo because when someone bought bread he also got information about the “Violence - Notice it - Help” campaign. The use of bakery bags for criminal prevention was a sensation. Concept "Be cool - stay cool"
The headline “Be cool – stay cool” stands for a decision making and responsibility training in violent situations in schools. In role-plays and training, conflict situations are explained to the young people and they learn how to act correctly. They also get information about the risks of defending oneself with weapons and they also are strengthened to hold out against verbal attacks. Be cool – stay cool is an important element of violence prevention in Frankfurt’s schools. At the beginning of the scholastic year, every school kid gets a time-table from the prevention council. On the backside of this time-table there is a model school regulation and a letter of the Lord Mayor to the teachers that they should also talk about duties, regulations, tolerance and solidarity in their classes. This time-table is also available on the internet. Bicycle prevention days are permanent parts of the district prevention work. At these events, bicycles are provided with a security number and by doing so they are theft-proof. Security systems, free bicycle repairs and security checks complete those events. They also are a good chance to get in touch with the young people living in the district. It consists information about the training of suitable behaviour close to practice. The salespersons are trained in dealing with offenders. Information and advice about technical aid, for example alarm installations and locks. Construction of an information system. With a telephone or fax chain, it is possible to warn the neighbours quickly so that measures can be taken in good time. Putting up the sticker: Emergency Number 110. Putting up a poster or a logo on the store, shows that the shop-owner is prepared and that he is connected to a security concept with other shop-owners. All these points are parts of a “complete concept”. In the urban district Griesheim it made sure that the problem with criminality in stores went down considerably. A dirty city is a city in which the citizens feel uncomfortable. A dirty city brings more dirt, the citizens adapt themselves to the situation and graffiti, vandalism and destruction gain ground. This is why the prevention council has got the target to strengthen the awareness of cleanliness. According to this, the regional prevention work also takes care of teaching cleanliness. This occurs, like in the urban district Schwanheim, with an annual garbage collecting activity. All citizens are asked to participate in this activity, and it is very successful with children, young people and families. Frankfurt´s school-theatre-studio is one of the most important parts for preventing violence in schools. In form of workshops and interactive theatre, the school kids reflect on violent situations and possibilities to resolve conflicts. In addition to the Frankfurt school-theatre-studio, there is a mediation program. The target of this programm is a constructive conflict structure in schools. In Frankfurt, the prevention of violence in schools is co-ordinated by a working group which also sees to it that the offers are coordinated and that the quality is guaranteed. Again and again, it happens that conflicts arise within a neighbourhood or housing estate between persons or families. That is the reason why the Office for multicultural Affairs has approximately 50 persons working as district mediators. They can be called to resolve conflicts without violence. Then talks are held with the persons effected to examine the problems and to find practicable ways for reconciliation. In the meanwhile, the project “social city” is training more district mediators in four urban districts. These mediators usually live in the housing estate and can be called in conflict situations. Sports, especially soccer, has got an extremely high status for boys and they also consider it as a method to reduce violence. 90% of the persons asked said that they feel safe in school. 82% decline violence. 16,8% accept violence to push through their own will. Only a small group of 7% of the boys have already exercised physical violence. Above all, boredom is a reason that violence is being exercised. 44% think that a better bringing up in schools and families can reduce violent behaviour. Sports and clear rules and laws follow with 25 and 24%. This is a very surprising result and it shows that especially schools and families have to do more about the bringing up. Result: Coming to the realisation that sports has a high status for boys and that boys don’t always want to join sports clubs, midnight sports is offered in Frankfurt on weekends. The young people are able to play soccer in open teams in sports halls and by doing so they aren’t out in the streets or dangerous places and they spend their leisure time under supervision. The SOS-emergency card is imprinted with all important emergency numbers as well as the service line number of the town clerk’s office. The security officers can be reached 24 hours a day and in case of an emergency they can help or they can call the police. In those districts which have a regional prevention council, regular surveys among the citizens are conducted. Here they ask about living contentment and areas were citizens are afraid of. Because of these surveys it is possible to plan police operations more target oriented and to adjust the social policy according to the visible deficiency. Poster campaign "Frankfurt forum" and "Violence against women"
Criminality exists in all social classes. Especially minorities are victims of violence. For that reason, the prevention council has got a working group which takes care of preventing violence against homosexuals and lesbians. This also brought up a poster campaign. Another big problem is violence in families. Especially in partnerships, the percentage of undetected crimes is extremely high. The prevention council has got a working group to help these women, to inform them and to reduce violence in partnerships. The first activity of this working group was to publish an information brochure for women. This brochure was also translated into different languages. It is the first activity of a big campaign against violence in families in the City of Frankfurt. To counteract violence successfully in the society, prevention measures have to start early and they have to include children and young people. The question is, how respectively with what kind of communication medium children can be reached. We decided to use a comic. It was developed by a well-known comic illustrator for the prevention council. This school year, all kids in 5th grade get this comic. In Frankfurt am Main, the criminal prevention work is coordinated, outlined and implemented by the office of the prevention council. 100.000 € are budgeted for projects and activities. In 2012 five persons are working in this office. Since the beginning of the new local security policy in Frankfurt, the crime rate is declining. The citizens think that the city is safer. In 1994, 57% of the citizens said that security is the biggest problem of the city, in 2011 there were only 10% who think so. The lowest crime rate since 1981 shows that Frankfurt’s way of fighting against criminality is also a successful one. 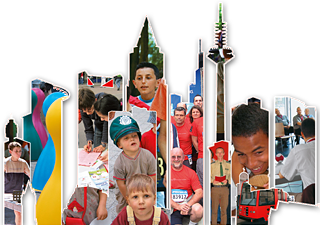 The Crime Prevention Council of the City of Frankfurt a. M. had been established in 1996. A presentation introduces the council´s experiences by explaining its structures, networks and strategies, such as approaching issues by expert teams and involving citizens through local district crime prevention councils. Some projects and examples are shown as well. Newspaper release "Forming an Alliance Against the Non-Culture of Looking Away - The campaign "Gewalt-Sehen-Helfen" (Violence-Notice it-Help) of the Council for Prevention of Crime and Violence in Frankfurt City" by Eva-Maria Föllmer-Müller, Current Concerns No 23, December 2009, Zurich, Switzerland.